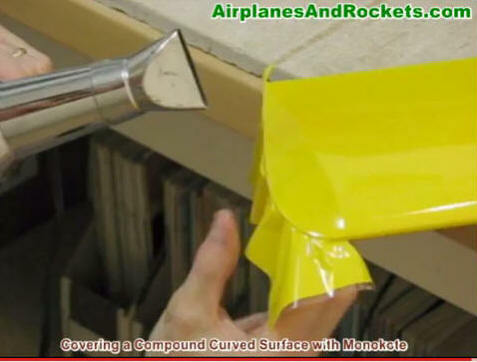 I took the occasion of having to cover the wingtips of my AAR-X1 electric control line model to make a short video of how I cover a compound surface (one that curves in two or three dimensions) with MonoKote. The only "trick" involved is being daring enough to apply the amount of heat needed to exploit MonoKote's extreme ability to shrink, while pulling on it to stretch it. By daring I mean that it can take quite a bit of heat, even to the point of being dangerously close to the melting point. It can also put the phalanges is peril while attempting to stretch the MonoKote while heating it. In the case of these wingtips, there is an open framework, but the method works equally well on solid compound surface. I have smoothly covered carved sailplane nose blocks and curved wingtips using this method. Be careful with the stretching force as it can become so thin that it is semi-transparent.